A bit about Franz Meyer and his collection. Franz . . .
At 16 she entered a convent, where, because of her close relationship with the Vicereine, she was granted incredible privileges. Her study walls were lined with hundreds of books and she spent her time studying and writing poetry — many of them it is believed — were love poems to the vicereine herself veiled in formal verse and with religious allusions. 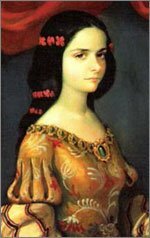 The brooch at Sor Juana’s neck carried an image of the Vicereine and when the viceroy was commanded back to Spain, Sor Juana lost her protection was forced to confess her sins and to give away her books and live in a simple cell until she . . . The accounts of travels on the Chinese Galleon, the Manila Galleon, the Nao de China — the ships were called many things — were harrowing. It was a six month journey to cross over from the Phillipines to the coast of southern California always with the threat of running out of water or being caught in a typhoon. From California, the vessels sailed down the coast of Mexico to Acapulco where they stayed for many months until the winds were right for the three month voyage back. Once anchored in Acapulco bay, the . . . 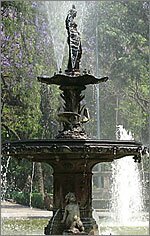 Here, high above the noise and hustle and bustle, you can begin to image life in the zocolo during the Viceregal Period in Mexico -- that 300 year period from the conquest to the War of Independence. 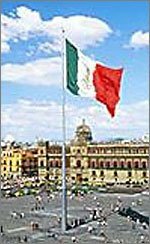 Within 100 years after the conquest, Mexico would go from being a Spanish outpost in the new world to one of the largest and wealthiest cities in the world. The conquistadores’ search for precious metals finally hit the motherlode, so to speak, in the silver mines of Mexico during the mid-1600s. By then the power and prestige of the conquistadores had waned -- in fact . . .
Today the sprawl of Mexico City has reached Coyoacan, but still it is a wonderful place to spend the day, full of parks, charming side streets and lovely little plazas, like the one surrounding the first church built in the new world -- Capilla de la Santa Maria de la Concepcion Imaculata, or La Conchita as it is called. In this church, we see the blending of the old and new worlds, the mudejar arch of the moors, the early Baroque and so on, the indigenous religion -- the sun and the moon and the floral pattern in the reliefs on the church facade. We see the artistic manifestation of the social experiment, if you will, of mestizaje, a mixing of the races that took hold in Mexico as in no other country in the western hemisphere and shaped its art, architecture, government, economy and even its national psyche. 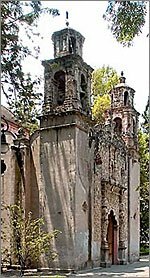 This simple church, the first one built in Mesoamerica, would be followed by another small church for the Indians called Santa Caterina and finally, once Tenochitlan was habitable again, by a small church in the Zocolo, or Plaza Mayor, of what was now the new Mexico City. It would take two hundred years to become the magnificent, baroque Metropolitan Cathedral that it is . . . I was all set to start blogging on my author site Mexico Trilogy.com as part of my marketing campaign, just something light and breezy, and then –- damn! -- if those tea party Republicans didn’t get on my last nerve when they shut the government and the economy down. 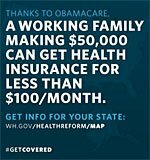 While my neighbors who work in the National Parks will be getting their salaries docked, our Representative Tom McClintock is raking in several hundred dollars a day plus government healthcare, healthcare he wants you to be free enough not to have. Since he makes roughly $174,000 a year, he really doesn't need his gold-plated federal employee insurance for himself . . .
Self-publishing my novel Palace of the Blue Butterfly was one little way of speaking truth to power. The novel tells the story of an older woman who longs for some kind of transformation. There is romance but not on the man’s terms. It explores the terrible period of McCarthyism in this country. 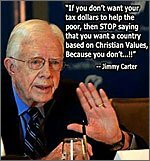 It does not glorify the very rich, and it refutes the lie that Americans are comfortable perpetuating -- that Mexico is a backward country full of desperately poor campesinos and drug lords. When the powerful in my little world said that the Mexican setting wouldn’t sell, that the love interest couldn’t be Mexican, that my protagonist was too old, I could have remained silent. I did not. While there was no gun . . .
. . . South. As everyone around here knows, I’ve been sick, really sick. After several days of terrible pain, Dave drove me down the mountain to the emergency room—otherwise known as The Village of the Damned—where I waited for five hours before being seen by the ER doc. The other lost souls in the waiting room included a stroke victim slumped in a wheelchair, a half starved, young woman clearly in the throes of a psychotic break, plus the usual folks with no health insurance, their faces covered with paper masks, who use the ER as a primary care facility. 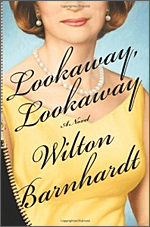 Fortunately, I had a really good book to get lost in, Lookaway, Lookaway, by Wilton Barnhardt of Raleigh, North Carolina. Years ago an agent told me I should exploit my Southern background in my writing. She meant Southern as in mansions covered in honeysuckle, spirited young belles and old black maids dispensing the wisdom of the ages. I tried to explain how the south wasn’t really like that anymore, probably never was, but it took this author to really nail it. Barnhardt is Dickens with a drawl . . .
. . . a story by Fresno writer Gary Soto called, "Being Mean," which the kids all loved. In the story, the children of a couple who are employed in a broom factory are left to their own devices during the summer. They do all the scandalous things you would expect kids to do under those circumstances, and needless to say, it does not turn out well. The first line of the story was this: "We were terrible kids I think." 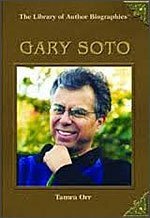 By the end of the student's writing and reflecting on the story, I always revealed something of Gary Soto's biography, that he was the son of farm workers in the Central Valley and now was a full professor of English at UC Berkeley and a renowned poet. Is there anything in this story, I would ask, that would predict this transformation from a terrible kid to an English professor? Just as I hoped, someone would inevitably point to the first line, to the phrase "I think". The writing assignment that night always involved . . . Unless you’ve been hiding under a rock and not reading my blog or downloading my book( link), you probably know my great affection for Mexico and all things Mexican. So, it’s not surprising that one of my favorite little California towns is Paso Robles or La Ciudad del Paso de los Robles, with its leafy town plaza and wineries. Okay, so now the town is sort of like Old Mexico meets Italy and Spain infused with San Francisco foodie culture. It was a great place to celebrate our anniversary this year before heading to the coast. 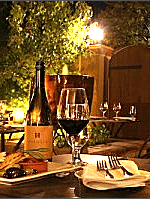 We wined and dined at the enchanting Villa Creek restaurant, the area’s old Mexico roots showing in the restaurant’s decor — oxblood colored walls, tapestries from Oaxaca, wooden box beams, austere Mission-style architecture, and of, course, a charming patio . . .